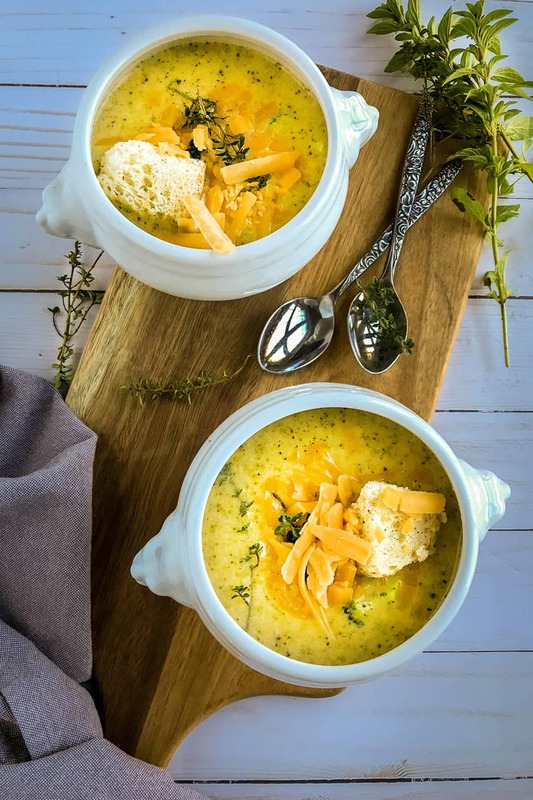 Instant Pot Broccoli Cheddar Soup is a creamy, cozy, delicious soup that’s still healthy and will warm you to your toes. It’s everything you love in a savory veggie soup in under 30 minutes! 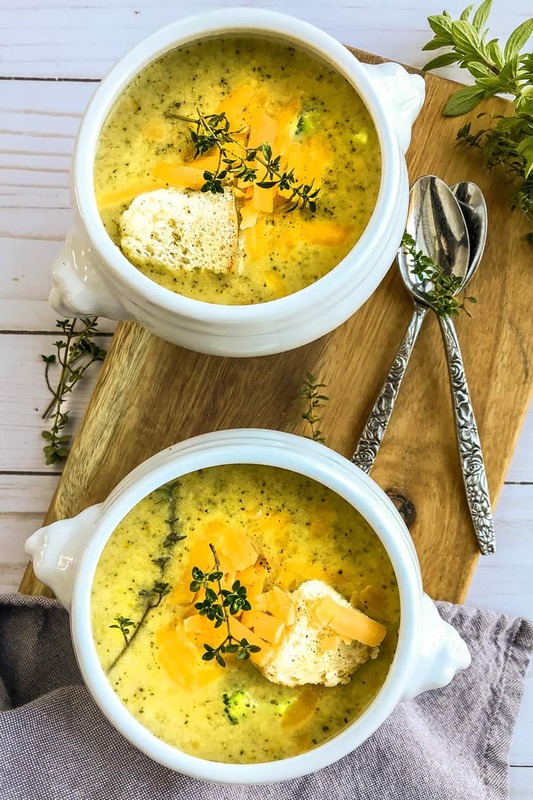 With simple ingredients like a couple of heads of broccoli, an onion, carrot, spices, and broth, this soup can be on your table in minutes. With very little cooking on your part! 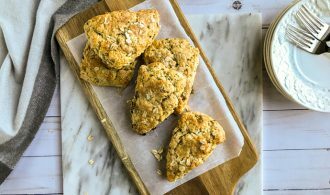 While this recipe is written for an Instant Pot — it can easily be converted to a slow cooker. Same ingredients, same easy method, different cooking times. Set Instant pot to the sauté function. Add the butter, onion, and carrot; cook 5 minutes or until fragrant. Add the flour, thyme, nutmeg, cayenne and a large pinch each of salt and pepper. Stir and cook for another 30 seconds to 1 minute. Pour in the broth, add the broccoli and bay leaves. Cover, select the manual setting and cook on high pressure for 8 minutes. 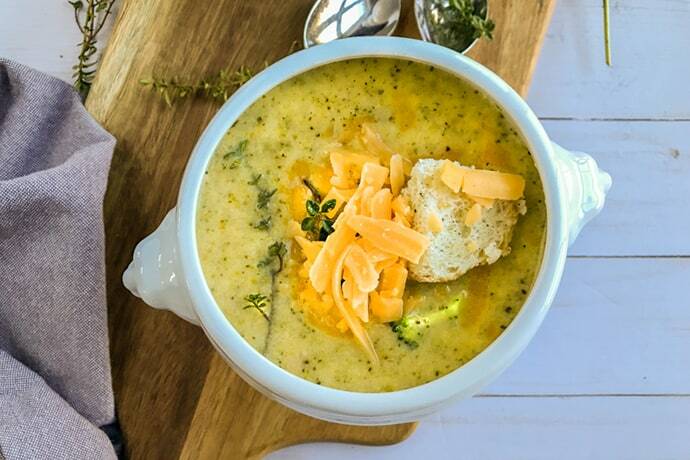 Puree the soup and return to the Instant Pot before stirring in the milk and cheese. Ladle into soup bowls and serve. More detailed instructions below. To the slow cooker, add the butter, onion, carrot, thyme, nutmeg, cayenne and a large pinch of salt and pepper. Stir and pour in the broth; add the broccoli and bay leaves. Cover and cook on HIGH for 3-4 hours, or LOW for 4-6 hours. Puree the soup, stir in the milk and cheese; heat through. Ladle into soup bowls and serve. More detailed instructions below. 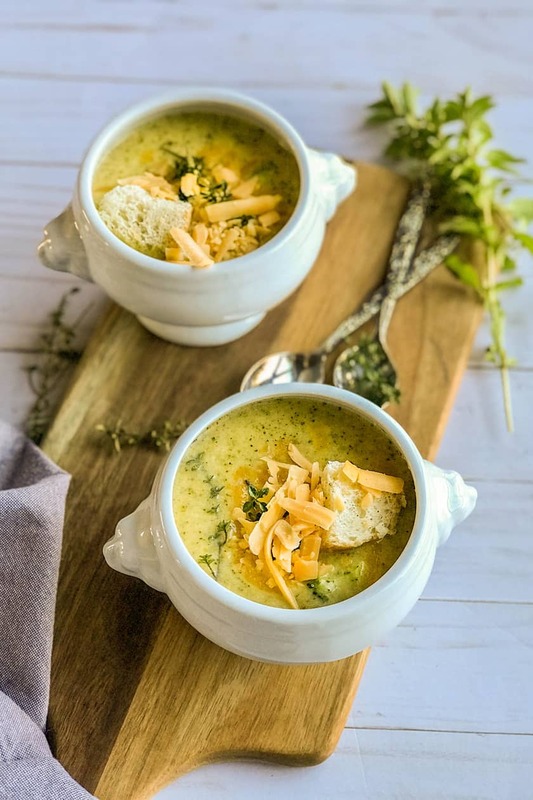 Instant Pot Broccoli Cheddar Soup is a creamy, cozy, delicious soup that’s still healthy and will warm you to your toes. It’s everything you love in a savory veggie soup in under 30 minutes! 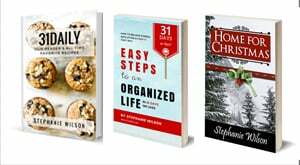 Continue reading for slow cooker instructions. Set Instant pot to the sauté function. Add the butter, onion, and carrot; cook 5 minutes or until fragrant. Add the flour, thyme, nutmeg, cayenne and a large pinch each of salt and pepper. Stir and cook for another 30 seconds to 1 minute. Pour in the broth, add the broccoli and bay leaves. Cover, select the manual setting, and cook on high pressure for 8 minutes. Once the soup has finished cooking, use the quick release function. Open the lid and remove the bay leaves; discard. Transfer the soup to a blender and pulse until chunky smooth or use an immersion blender inside the pot. Return the soup to the instant pot if using a blender. 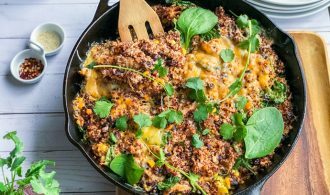 Set the Instant Pot to sauté; stir in the milk and cheese, and cook another couple of minutes until the cheese has melted. Ladle into soup bowls and garnish with fresh thyme leaves, additional shredded cheese, and French bread cubes if desired. To the slow cooker, add the butter, onion, carrot, thyme, nutmeg, cayenne and a large pinch of salt and pepper. Stir to combine and pour in the broth. Add the broccoli and bay leaves; cover and cook on HIGH for 3-4 hours, or LOW for 4-6 hours. Once the soup has finished cooking, remove the bay leaves and discard. Transfer the soup to a blender and pulse until chunky smooth, or use an immersion blender. If you used a blender, return the soup to the slow cooker and turn the heat to high. Stir in the milk and cheese, and cook 10 minutes or until the cheese has melted. 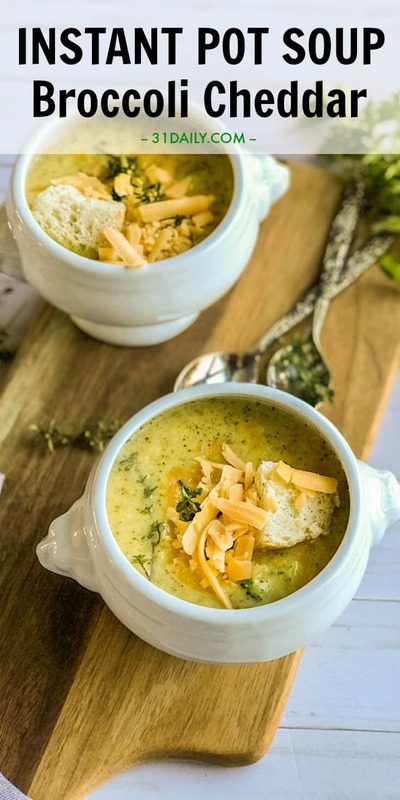 Ladle the soup into bowls and top with fresh thyme, additional shredded cheese, and French bread cubes if desired.